Canadian Daily Deals: ZebraCoupons.com Websaver's New Mail Coupons Website! ZebraCoupons.com Websaver's New Mail Coupons Website! There's a new website to get your Mail To Home Coupons! 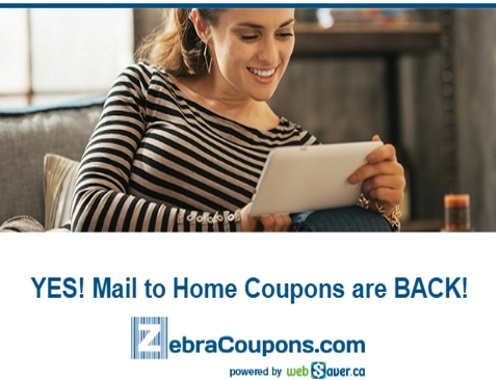 This new coupon website brought to you by Websaver called ZebraCoupons.com provides the convenience to those customers who, for whatever reason, prefer mail to home coupons. They've partnered with some leading brands and publishers to gather a ton of coupons that are only currently available as Print at Home that can be ordered as Mail to Home. You can order up to 48 coupons of your choice from well-known, leading brands. Order directly from your phone, tablet or desktop, and we'll print them in full colour, on cashier friendly paper, and mail them directly to you by Canada Post. Just pay a nominal convenience fee of $2 to cover the postage and handling. It's that simple! ZebraCoupoons hasn't launched yet, but they plan to go live later this week, we just wanted to give our readers a first heads up. We will also have promo codes when it is up and running to share with you all so stay tuned! The promo codes will give our readers a "free" order so you won't have to pay the nominal fee to have the coupons sent to you.